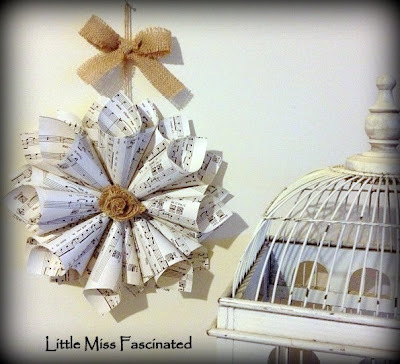 Little Miss Fascinated: Antique Sheet Music Wreath Tutorial.. Yesterday I posted my Fat Mum Slim photo for the Photo A Day Challenge.. The feedback about my wreath I made was amazing - thank you all so much - and I was asked for some help and instructions on how to make one by a dozen or so people, so I thought I would put this tutorial together!! Now, be gentle with me - this is my first tutorial and all I had was my iPhone!! Haha.. 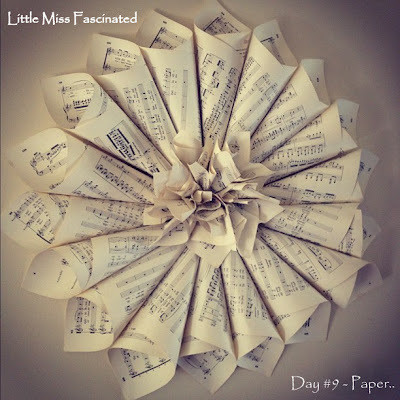 The materials you will need is some sheet music (I purchase mine from thrift stores or secondhand book shops), cardboard, scissors, glue (I use a hot glue gun because I don't have the patience for craft glue but it would work as well! I would recommend hot glue for the assembly though as the wreath gets a little bit of weight about it once it's together! ), a side plate template in size and a large cup template in size to trace around. The end result of the wreath done with a full music sheet is about the size of a large car tyre, so I use a side plate template for this size. Simply trace around the plate..
And then place your smaller template inside (the cup) and trace around.. This should be your end result cut out..
Now to make your cones. Grab the two corners of the longest side of your page.. Twist the left side towards you and the right side away from you.. It can be a little tricky until you get the hang of it! You want your left corner to roll into the sheet and your right corner to roll over the left corner..
Keep rolling your sheet over until you have the desired tightness you want for your cone. The looser your cone, the larger they are - the tighter the cone, the thinner they are! Add a spot of glue at the right hand bottom when you have the size you want..
Now get some cones made!! You can make as you go, but I like to make them in a pile ready to grab. The average wreath this size takes about 20..
Add a spot of hot glue on the cardboard and slide the next cone in until you fill your first quarter, then repeat for the rest of the wreath! Now for the centre 'flower'.. Cut a sheet in half like so..
Place one hand in a circle type shape..
And put one half of your sheet over it. Push the middle down with your finger and scrunch as you go.. This part is supposed to look messy to get volume, so just have fun with it! This is what your 'petals' should be looking like - messy & scrunchy! Now glue them together at the bottom & keep adding 'petals' until you get the desired thickness of your 'flower' that you want.. Pop some glue around the base of the finished 'flower' and stick it in the middle of your wreath where all your cone points meet.. It doesn't matter if this parts looks messy, you won't see it! Now flip over your wreath and put two holes in the cardboard where you want your top to be, this is how we get it ready to hang..
Thread through some ribbon or string..
Now grab your side plate to trace out another full circle like we did at the start BUT don't cut out a middle in it!! Hot glue gun around the outside of the circle and press firmly to the wreath circle, covering the cones tips and the string..
And, voila!!!! Turn it over and hang in your favourite spot!!!!! Here are some others I made - the options are endless! This one was made for a client to give as a gift to her crossword loving sister - it's made from an old 40 year old dictionary.. This one I made out of smaller pieces of sheet music paper for a client to hang on her door as her Christmas Door Wreath.. So there you go!! I hope the photos and descriptions are helpful and easy to understand. Please feel free to 'Pin' this tutorial on your Pinterest board! Comment below or message me at littlemissfascinated@hotmail.com if you have any questions - and I would LOVE to see your wreaths once they're made, so send me a photo or post a link below!! I am a music teacher and wanted something to hang on the door. This is perfect! Thank you for posting! About how many half sheets do you use to create your middle flower?